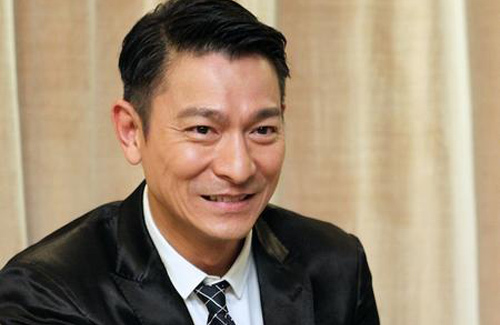 Hong Kong singer/actor Andy Lau (劉德華) recently put together a birthday celebration for his daughter, Hanna Lau (劉向蕙), who turned four years old on May 9. In order to prevent photographs of Hanna from being leaked to the press, Andy handpicked each of the birthday party attendees. Although Andy has typically maintained an extremely low-profile approach to raising his daughter, he understandably still wishes for Hanna to experience normal social interactions with other children her age. As a result, he decided to celebrate her fourth birthday with a party. Rather than hold the party at a luxurious hotel, Andy chose to celebrate at Andy World Club, a venue he established in Hong Kong for his fans. About 50 people attended the birthday celebration, all close friends or familiar acquaintances that were handpicked by Andy himself. The theme of the party was Disney princesses. Despite Andy’s wishes that photographs from the event remain private, a group picture taken during the celebration recently surfaced online. In the photograph, Andy can be seen hugging a long-haired young girl who is smiling broadly. Many netizens assumed that the girl in the photo was Hanna, but it was later revealed that when the group picture was taken, Hanna was off to the side with her mother, Carol Chu (朱麗倩). Carol’s reluctance to appear in photographs may have increased even more due to the recent stream of rumors that she is pregnant with the couple’s second child. In March, she was alleged to be already four months pregnant. However, the couple has yet to confirm the pregnancy reports. Yeah, Andy is too overprotective. The more he wants to hide her, the more the media wants to find out (maybe that his intention?) She wont live in a normal environment if he keeps on being like that. Man, that can be an annoying dad. I like how Jacky Cheung handles his daughters, not too expose and not overprotective. Sigh. Love Andy but I have to agree that he is too overprotective. She won’t have a normal life like this. Hopefully, as she gets older, he will bend more. oh man, if Andy keeps up with his over-protectiveness even to until she’s in her teen/teenager years, i expect to see a rebellious daughter in the near future with Andy’s way of parenting. i’ve always wonder behind Andy’s logic in making his family like “invisible.” I salute his wife for being able to bear with his ways. @akinu If he continue to be too overly protective, Hanna may end up being very socially awkward. He is what we call “helicopter parent.” Too protective of their child, which prevent their child from growing up, being independent and they won’t know how to deal with society once they have to enter it. Hope it won’t lead to that. But yes, It must not be easy being his wife. @happybi that’s another possibility. what i said earlier was just purely based on what i saw with how my uncle raised my cousins. he was that typical overly protective father and all my cousins all grew up rebellious because they were so sick of having no freedom. @akinu just have to wait and see! @akinu she’s rich, will be a spoiled brat. Just like most of you who handpick your guests for your wedding. The media is just making it a big deal. When my neices were very young, my sister decided whom to invite to her kids’s birthday parties too. Her daughters (still under 12) are very normal and outgoing now. @rainbow28 That’s good to know.. and you made a good point.. just that for us normal people.. we normally don’t pick who to invite I guess.. we just normally invite the kids that is in the same class as our kids school/daycare. @rainbow28 that’s not even the same. Did your sister hire protection for her daughter? Did your sister allow her guest to take pictures? Did your sister take her daughter to go shopping? @skyking OMG, my sister is not a celebrity and there are no paparazzi following her or her daughters and even if they have, the pictures don’t mean anything to other people, duh. She doesn’t have the money to hire protection for her daughters but she has their grandparents to take care of them. I was just saying that there is no problem handpicking attendees for a party. @rainbow28 then why are you comparing the two? We are talking about his secretive of his daughter. Hiding her from the world. Of course Andy can handpicked anyone he wants. He’s the one paying for the event. @bubbletea Andy’s daughter is only 4 years olds. What do you expect from her picking from her few friends around her age? Do you think she is old enough to pick like 50 or more people to attend her party? Yes, she can pick a few classmates but she is still so young. Maybe there’s too many kidnapped going on and too many strangers around that’s why he so protective for his family. Look at Cathy Tsui, Gigi Lai and Michelle Reis you don’t really get to see their children also because they’re also very protective just like Andy. I’m sure they’re super rich to hired lots of security guard. This is just my opinions who know right? @asian2015 good point. Especially since he is so well know. @asian2015 Good point. Not to mention that I know how Hanna looks like but I don’t know how Cathy Tsui’s children and Jayden look like (except maybe newborn pictures but not when they are older) due to their lack of exposure. I only saw Gigi Lai’s first twins’ faces from pictures taken by paparazzi when they arrived at / left their first birthday party location. @asian2015 When was the last time you heard an idol or their child/ren were kidnapped. Of course these people have to watch out for themselves and their families at all time, no questioning that. Andy however, creates a lot of unnecessary drama. Everyone knows who he is, who his wife is, and yet when she is out in public with him, she has to wear a mask. That is a bit strange. It is like he wants to create a dynasty , a mystery about his family, at the expense of their freedom and tranquility. When I think of Hanna and Carol, I picture the fairytale story Rapunzel. The girl locked away in a tower. Maybe that is what Andy wants to create, a fairytale. Andy is a savvy and shrewd businessman but he might be a bit cooky in the head. @bubbletea If you have ever been to HK, you’ll see that it is very common that some people who are not celebrities wear a mask. They can wear masks for different reasons. It doesn”t mean that they wamt to create a dynasty. For example, Andy’s wife might wear a mask because she has a cold, doesn’t wear makeup and feels uncomfortable about her look, pregnant and tries to avoid inhaling pollutants, etc. Please be more understanding and considerate. @rainbow28 Look, I know you are a die harder fan of Andy and that is your business. Do not however, ask me to be understanding of a situation you created out of your loyalty to Andy. Over the years when I see Carol with friends, family, out shopping and running errands with bodyguards and nannies, she does not wear a mask. She wears it only when she is with Andy. It is insane as everyone knows who she is, no need for the mask when with him. I guess she has a cold when she is with him, I guess she avoids inhaling pollutants only when she is with him. FYI, there are lots of pictures of Carol Chu while pregnant without a mask when she was not with Andy. Andy does not want to give the public and the media the satisfaction of seeing him and his wife together , bot without masks because he is still angry that his marriage got exposed. If that did not happened, he would still be pretending and lying to the fans and threatening lawsuits that he is not married., so he is not happy to be photographed with the wife with both of them not in a mask. Now, what was that that you were saying about being more understanding and considerate?. @asian2015 Agree. You never know what nutters lurk around the corner. And the more guests, the harder the party is to control. I think it is better to have a selection of close family and friends and have lot of fun rather than invite big crowds which may scare little Hannah. I don’t see a point in parents handpicking the guests. It is a private party and he is paying for it. He can invite whoever he wants. @elizabeth I don’t think any nutters would have gotten close to the place. The guests would have had their cellphons confiscated and be scanned for weapons, etc. No one challenged the amount of guests at the party. Yes Andy paid for the party, so he can invite who he wants. It is just that the article never mentioned that Hanna had any input to invite the ONE or TWO only friends she may have. Like I said, all the kids around the world get the wonderful, exciting chance to invite some little ones to their party. Even two year old. One gets the impression that Hanna will not be allowed to make any choices in her life as she grows. @asian2015 I think the problem with Andy is his overwhelming effort to be secretive, which sets him apart from all the celebrities mentioned in this thread. No one is asking to see his daughter’s face or anything like that and just like other celebrities, it’s understandable for him to want to keep his child out of the limelight. But with Andy, he goes overboard in that he doesn’t even want to talk about his wife and daughter in public or even acknowledge their existence. Like whenever reporters would ask him a simple question “How are your wife and daughter doing?” (which doesn’t require Andy to reveal any personal information whatsoever), he either refuses to answer or tells the reporters not to ask or changes the subject, etc. Why can’t he just respond with a simple “Fine, thank you” generic canned response? I think that’s the piece that annoys people – what’s wrong with talking about your wife and kid? It’s not like people don’t know they exist. Someone mentioned Jacky Cheung above. He’s superstar level celebrity too, plus he’s known in the industry for being low profile and immensely private, yet he doesn’t overprotect his daughters or go out of his way to be secretive about his family like Andy. Sure, he doesn’t volunteer info about his family on his own accord, but whenever he is asked about his wife and daughters, he talks about them like any other ordinary parent does. In fact, if the person interviewing him is one of his friends and also a parent themselves, he will chat with them on and on about his daughters (to the point that the entire interview is about his daughters and family life rather than the original purpose of promoting his album or whatever). He also takes his daughters out in public and doesn’t try to hide them, but at the same time, tries not to draw attention to himself (which is very much in-line with his low key personality). Andy is hard working and all that and his family should benefit from that hard work. I think that his daughter should be able to choose at least some of the guests seeing that it was her party. Andy is a well known control freak and he controls everything. I do believe that Hanna will rebel if her father’s contolling habitscontinues in her life. The little generation growing up now is very fiesty. Her mom, being fifty, is old school as in obedient and submissive and agrees with whatever Andy says. That is not going to be the case with Hanna when she gets older. @bubbletea will be intetesting tl see when she grow up.